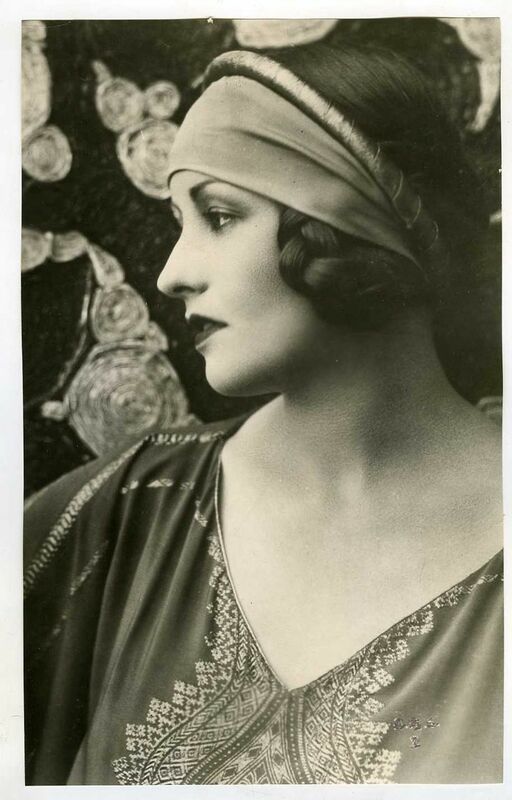 Happy birthday to Natacha Rambova, born on this day in 1897. 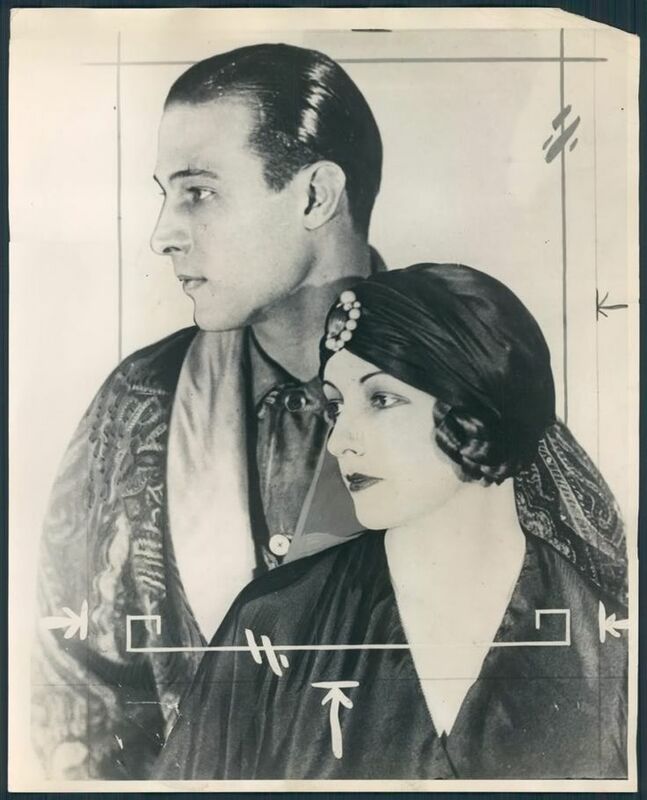 Rambova is best remembered for her contentious marriage to famed 1920s heartthrob Rudolph Valentino, but it is perhaps less well-known that she had a successful costume and fashion design career. Born in Utah as Winifred Shaugnessy, Rambova would not acquire her more alluring Russian-sounding moniker until she became a ballerina in Theodore Kosloff’s Russian Ballet School in New York City. She eventually became the costume designer for Kosloff’s dance troupe, following the choreographer to Hollywood in 1917 to work in film, first as an uncredited designer in Kosloff’s projects, but later as a successful costumer designer/art director in her own right. Her more well-known films include Camille (1921) and Monsieur Beaucaire (1924). It was during this period that Rambova met and fell in love with Valentino, marrying him in 1922. Her high-profile romance with one of Hollywood’s biggest stars made Rambova a celebrity in her own right, their short-lived love affair–and Rambova’s impeccable fashion sense–became the topic of international delight and intrigue. During a period when the chic simplicity of Coco Chanel’s designs were the height of fashion, Rambova possessed more extravagant tastes, turning to designer Paul Poiret for her wardrobe. 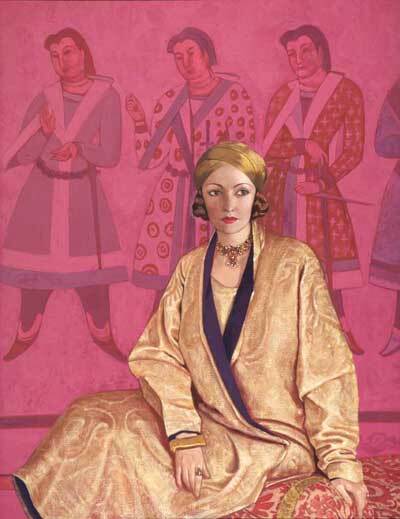 According to Valentino, Poiret “was the one costumier in Paris best suited to Natacha’s style.” They both shared a love of the exotic East, the luxurious, the extravagant. 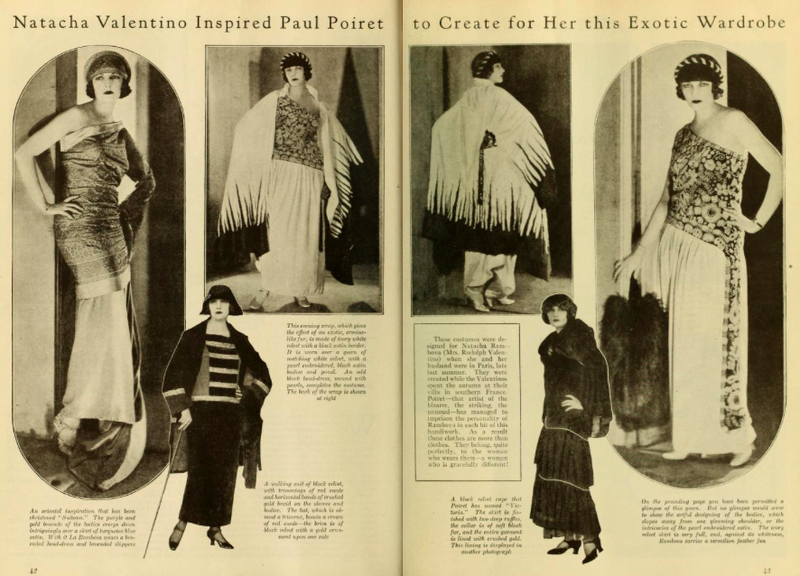 Rambova’s Poiret-designed wardrobe was highlighted in the January 1924 issue of the popular film fan magazine Photoplay, featured below. Rambova’s marriage to Valentino ended in 1926 and she soon turned her attention from Hollywood to high fashion, re-locating back to New York City in 1928 to work, albeit briefly, as a couturier and a wholesale designer. According to fashion historian and Rambova expert Heather Vaughan, Rambova “created clothes with character and for characters,” a design aesthetic drawn from her “European education and influences, as well as her love of history and art.” Rambova’s more exotic and Eastern-inspired tendencies were revealed in designs characterized by brilliant color combinations and the unique incorporation of geometric shapes. Unfortunately, Rambova’s career in fashion was brief, her couture business and commercial fashion design ventures ended with the onset of the Great Depression in 1931 when she moved to France. Rambova died in 1966.